TJL Environmental Health Consultants, Inc. provides Radon Testing in Charlottesville, Richmond, Culpeper, Harrisonburg, and throughout Central Virginia. How Common Is Radon in Central Virginia? Radon is a radioactive gas found in homes and businesses throughout Central Virginia. Radon comes from the natural breakdown of uranium in soil, rock and water and gets into the air you breathe. Radon typically moves up through the ground to the air above and into your home through cracks and other holes in the foundation, but it can also enter your home through well water. Is Radon Testing Necessary In Charlottesville and Central VA? Nearly one out of every 15 homes in the United States is estimated to have an elevated radon level (4 pCi/L or more). Charlottesville and Central Virginia radon levels mirror national averages. 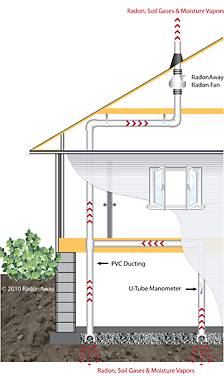 Even homes that are next to each other can have different radon levels. Testing for radon is the only way to find out what your home's radon level is.